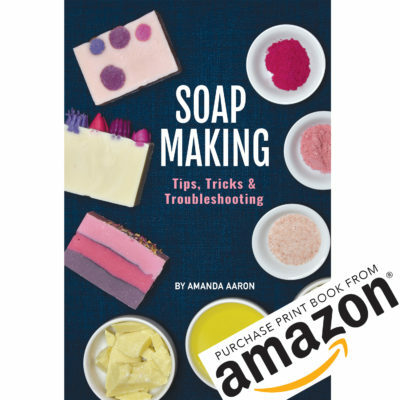 Most tutorials tell you how to shred down a bar of soap to mix with borax and washing soda. To make your handmade laundry soap even cheaper, you can make a suitable bar soap yourself! I prefer to use a 100% non-superfatted coconut oil soap for my soap shreds. 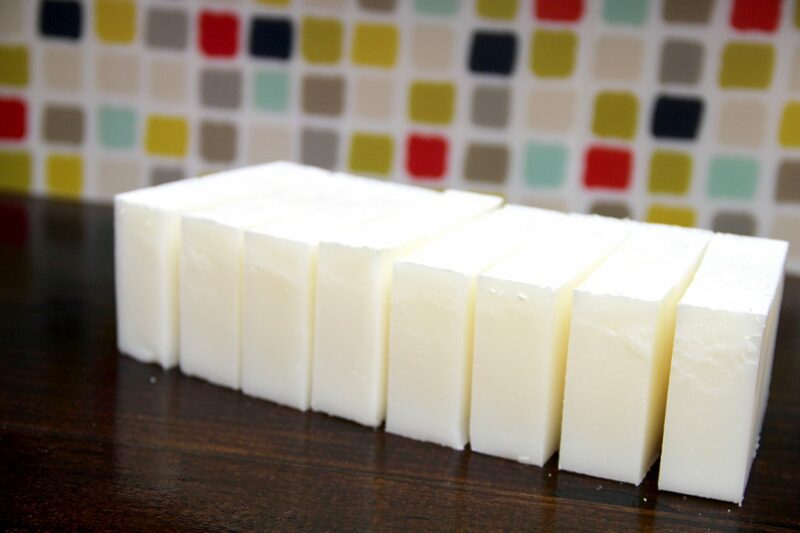 You can also use a 100% lard soap, but I’ve found that because coconut oil soap is super cleansing, you can use less in the final recipe. When you run your recipe through a lye calculator, you will select 0% superfat. We don’t want any oils left over unsaponified to gunk up our washing machine. This will be a high cleansing soap, so don’t use it on your body. This recipe and tutorial assume that you have basic knowledge of cold process soap and have made a few batches. 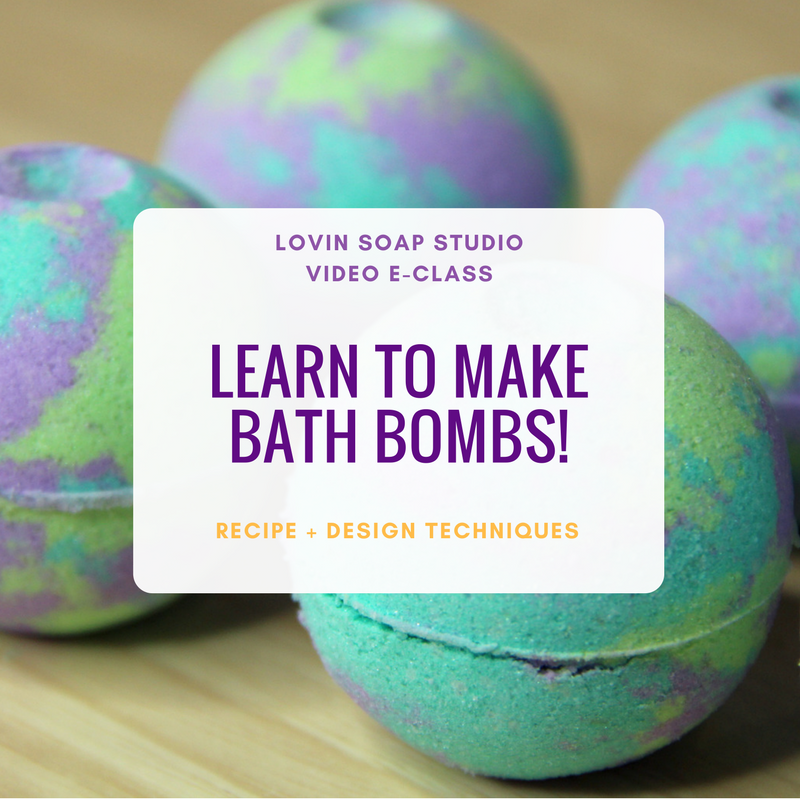 If you are new to soapmaking, please check out our basic tutorials to learn more detailed information. 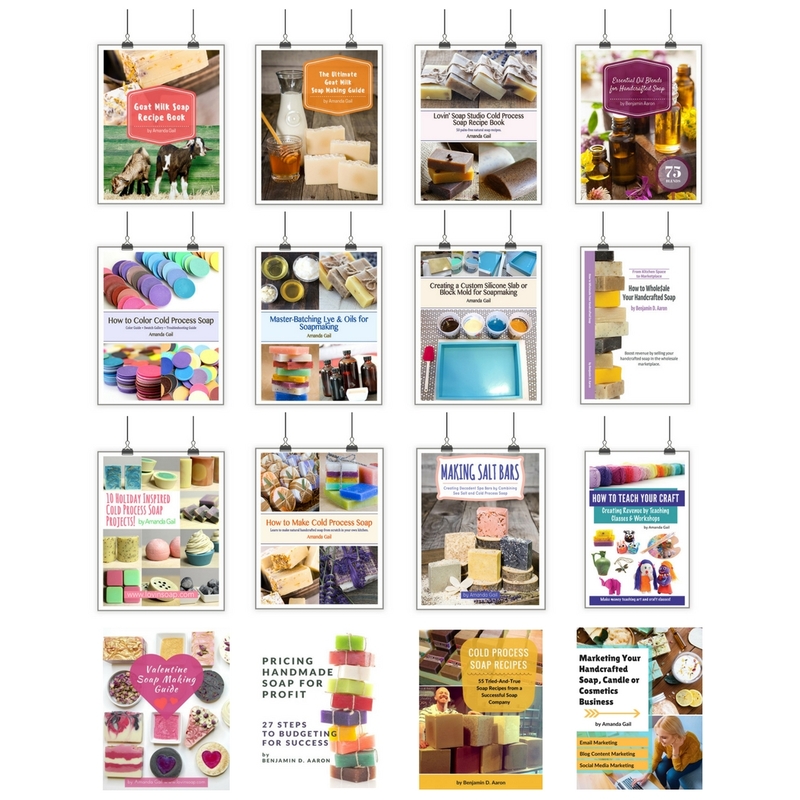 Our basic soapmaking eBook is an excellent resource for learning the basics of soapmaking. 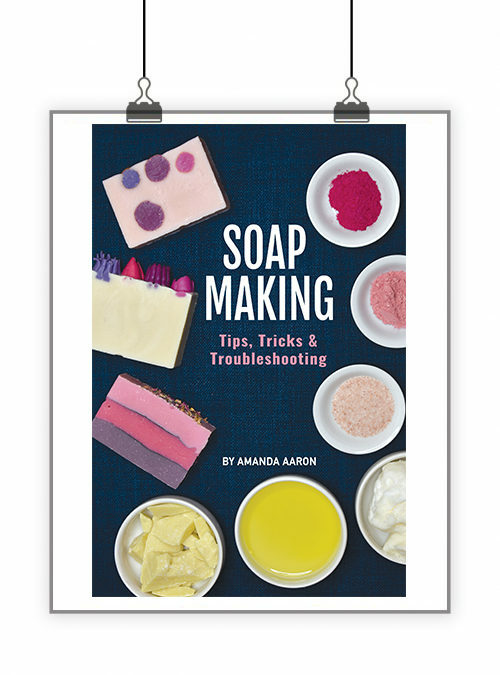 If you have some soapmaking experience, you can probably follow along with this tutorial. My favorite places to buy coconut oil are from Soaper’s Choice and Bramble Berry (affiliate link). Bramble Berry is great because their 7 lb coconut oil comes in an easily managed bag you can boil or microwave to melt. How awesome is that!? Make sure you get Coconut Oil 76 Degree. Never use fractionated coconut oil. Sodium hydroxide – 5.8 oz. 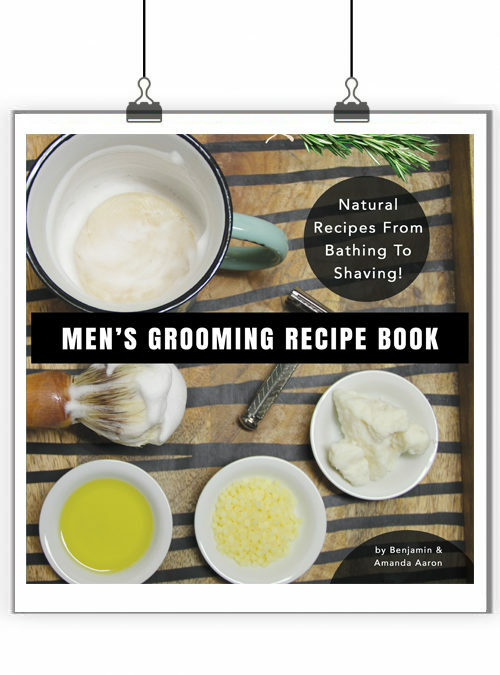 *Don’t add fragrance or essential oils. We’ll add that to the actual laundry powder. Wearing safety gear, make your lye solution by weighing out the lye and water into separate containers. Sprinkle the lye into the water while stirring. Stir until dissolved and set aside to cool. Weigh 32 oz. coconut oil into a heat-safe container and melt. Check the temperatures of your lye solution and oil mixture. Each should be under 90 degrees F. If not, let cool a bit longer. The hotter the mixture, the faster it will get thick and possibly cause issues. While stirring the coconut oil (with stickblender off), pour lye solution into the coconut oil. Using short bursts with your stickblender, mix until trace has occurred. It should happen quickly with a 100% coconut oil soap. You can even stir with a whisk instead of a stickblender if you prefer. Pour the soap into your mold. This recipe fits perfectly into a 10″ silicone loaf mold (affiliate link) from Bramble Berry. Allow to sit and harden overnight. Cut the next day. Sometimes you can cut 100% coconut oil the same day. 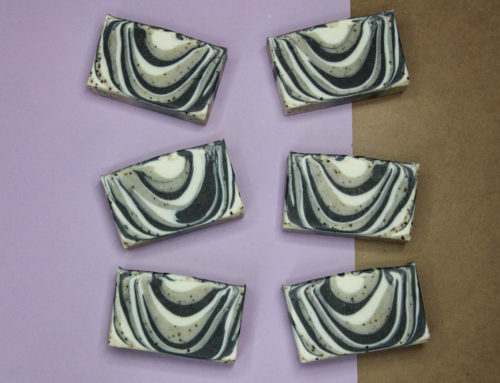 Alternative Method: When you get good at making this soap, you can experiment with making your lye solution, scooping out the coconut oil that you need, adding the hot lye solution to solid coconut oil to melt and mixing to trace. 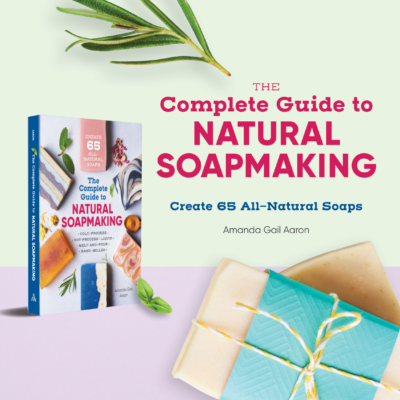 This is an advanced method and should only by used after you’ve made several batches of soap. 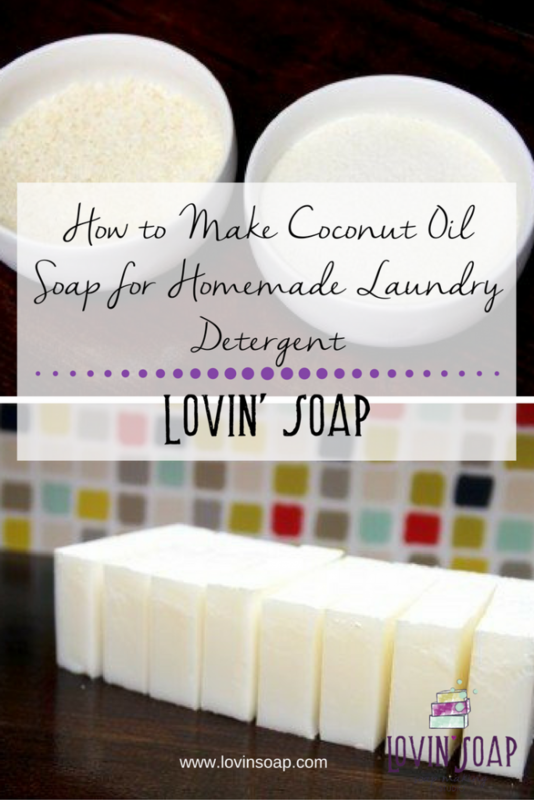 *This coconut oil soap does not need to cure before you turn it into laundry detergent. Let’s make DIY Natural Laundry Detergent! 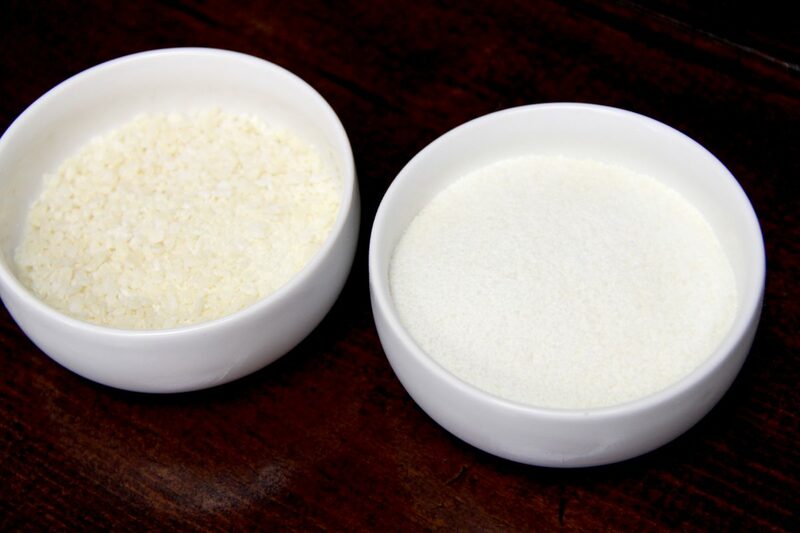 Homemade laundry detergent is made by mixing shredded bar soap with borax and washing soda. Soap – Soap is an emulsifier and surfactant. You’ve probably heard of the term emulsifier. An emulsifier is a substance that creates an environment in which water and oil can mix. Soap suspends oil and dirt so that it can be washed away during the rinse (or during your shower). Borax and washing soda are laundry boosters. They contribute to an ideal environment in which soap can do its job. Washing soda acts as a solvent to help remove stains and helps treat hard water by binding to the minerals. 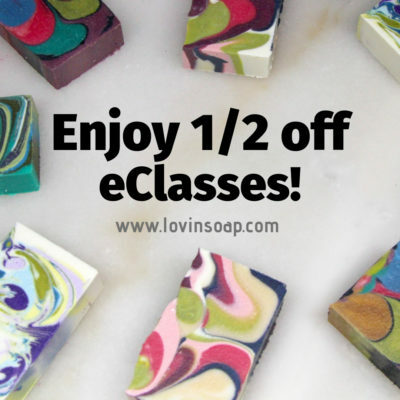 You don’t have to wait for your bar soap to cure. You can shred immediately and allow it to dry out. I like to run my bar soap through a salad shooter. Lay it out on a tray to dry for a day or two and then pulverize the shreds in a food processor or coffee grinder to make a powder. The finer the soap powder/shreds, the easier they will dissolve in the washing machine. Below is a picture of soap shreds on the left and powder on the right. Warning *When you powder your laundry shreds you have to wear a mask or respirator. You don’t want soap powder in your lungs. Mix everything up and package in a bag or jar for use. You can play with different amounts of soap powder, borax and washing soda. Sometimes you have to tweak the recipe for your water. 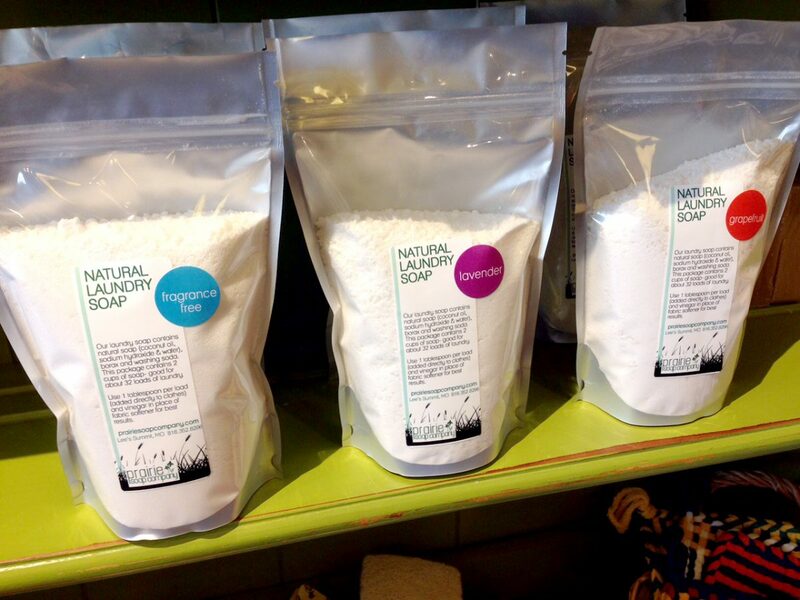 To use: Scoop 1 tablespoon of natural laundry soap directly into your clothes washer. Use vinegar in the rinse cycle to help prevent soap scum or buildup. Enjoy your natural laundry soap! I am curious however, as to whether thr powdered soap can be used to do re-batching? Would it mean that we could achieve a more fluid consistency in the crockpot rather than the vaseline-like consistency from melting soap shreds? Amanda, Love the soap, been using for awhile. Where did you purchase you vapor bags that are in the image? Love the soap, making it for awhile now. Where did u find the pouches you packaged your soap in? What size are the pouches in the photo? Hey! So I’ve made the coconut bar, but when I grate it up, it isn’t dissolving. Same goes for other non-toxic detergents I’ve bought. The water is at around 80F so not too cold. I was wondering if there is an additive I can put in the soap to make it easier to dissolve. If you make the bar with 0% SF or even better.. slightly lye heavy, it helps. Adding 1 TBS of Borax per 1 lb batch helps. Adding this to the soap pot before trace. This helps the bars come out harder and dryer. Along with hot processing. 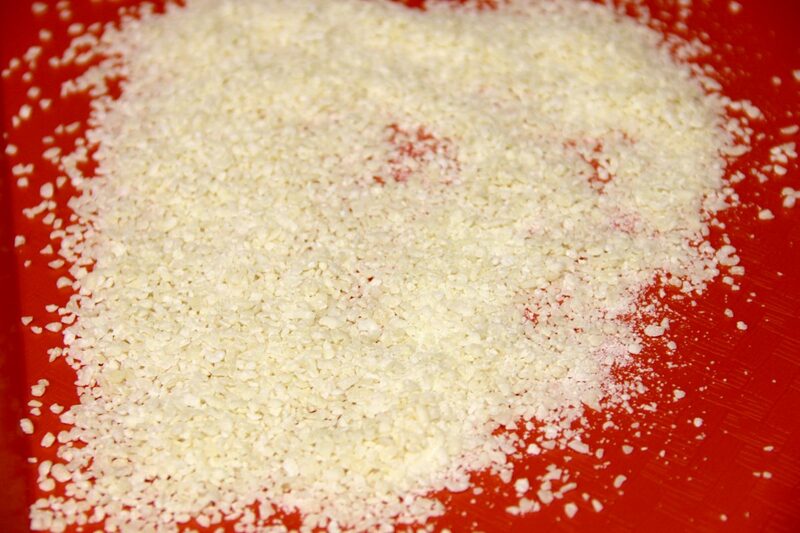 If the bars are dry and hard, they grate up easier and produce a finer powder..that also disolves faster. As per instructions to use 1 tablespoon of this natural laundry soap, what is the maximum laundry load? I am using a HE front load machine with a maximum load of 11kg. Will it produce lots of suds or damage clothes if higher quantity of soap is added? Sorry to go on with this, but.. With my background in chemistry, I can’t help but also ad that it’s also worth noting that the minerals in water can de activate a pure soap, opposed to detergent. Mainly the calcium and magnesium in the water. Also certain Stains, such as tannin (coffee, tea wine ) can be set in with soap vs detergent. So one would do well to pretreat those stains and remove before hand if soap is going to be used. Let’s get back to the hard water.. If you’ve have a top loading machine and you plan to use soap, the best approach, would be to start filling the machine with hot water, and ad your washing soda and borax, do not add clothes yet. Allow agitation to run for a min or two. This allows the two softeners to sequester and bind up the minerals before they have a chance to deactivate the soap. Doing it this way, your ensuring that water conditions are at their best to receive soap. Add soap and continue to agitate to disburse and desolve, then ad the clothes. This may all sound odd, but it was common practice during the 30s and 40s when soap was the only surfactant available. The advent of synthetic detergents after WWII, changed things dramatically. Cooler temps could then be used, Sodium Tri Poly Phosphate was included in the mix, which is a far superior water softener than the borax and washing soda, in that they form a complex with hard water minerals which also allows them to rinses away easily. No need for sour rinse, or boiling laundry to remove soap build up. 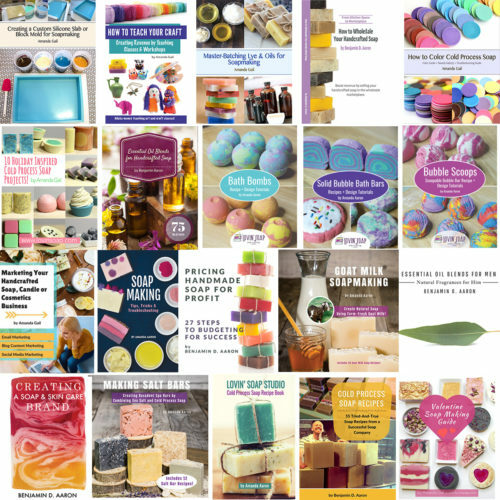 Hope the little history of soap, it’s uses, procedures, and ratios are helpful and useful to someone ! If you read the back of the box of washing soda, it says to add 1/2 cup of soda “with” your detergent. The above formula comes no where close to having enough of any of the three ingredients to clean anything. It’s really like 1/8 of a TSP of each ingredient for a whole load of dirty laundry. For a top loading machine try 1/4 cup of the soda, 1/4 cup of Borax, and 1/4 cup of soap. Reduce by half for a front loading machine. Hi mam can I add essential oils to the coconut soap? Q1) When to add vinegar? During the rinse when all clothes are all in it? Q2) Also, do u mean you add EO while mixing the ingredients then you store in? Q3) How much do you add per 7kg full load? Why can’t you put this soap in the dispenser? This is the first time I have seen that this might not be a good idea. My washer does a full rinse before it does the wash so it drains once before washing. If I added it to the clothes at the beginning it would just be rinsing it away before the wash cycle. I can’t change the setting either which is frustrating. I wanted to make this for a stain stick. Could I pour it into a 2 oz. twist-up plastic container? Didn’t know if it would get stuck or actually work. Thank you for your time! I use these as my prewash spray replacer. Is there any way to add air to them so they will float when I accidentally drop them in the washer? Hi ma’am,I sacrificed all my appointments for today just to search for you and it looks like I made the right decision.i just wanted to be enlightened ma’am about the putting of essentials(fragrance) like lavender,rosemary,etc. Because essentials are liquid and we put it in the end of procedure,I wonder how would the finished soap be dry? Pls help.thank you.god speed. She’s only adding a very small amount. Use a dropper and drop it in as you are mixing dry ingredients together. The scent will disperse throughout the soap! Thanks for the recipe Amanda! I made these yesterday and actually would soap a bit warmer as it took quite awhile to get a thin/medium trace to pour into the mold. Can you water discount? I was surprised the water was more than 2x the lye…but maybe so it doesn’t accelerate too quickly with the hard coconut oil (I’m still new at 100% coconut soap)? The other thing I would not do again is wait until the next day to unmold and cut. In less than 24 hours, my bars were so hard, they cracked when I cut through them. I’ve heard of others cutting in as little as 4 hours. I will definitely unmold and cut after 12 hours at most next time! This recipe is expensive too. Borax is very expensive in Asia, and there are lots of commercially produced laundry detergent with low price, but I am not sure about their quality. 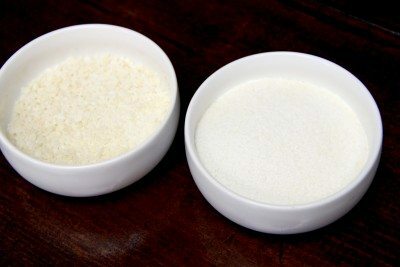 Unfortunately soapstones (Talcum powder)are used instead of sodium carbonate(soda ash). Because it is very cheap here, one Mt costs only $ 1. And Talcum powder doesn’t have any cleansing properties. Thanks dear Amanda for the recipe you provided, it is a powerful detergent. Can you please help me with getting the soap from shreds into a powder? Was the food processor effective or was it the coffee grinder that worked better for this? Does it matter if I cannot get it into the powder form? Last question…haha…do I need to use warm water in the wash or will cold be as effective? What is the reason for putting it directly into machine? Why do you not have to let this soap cure? Great information.Your recipe for Natural Laundry Detergent is perfect. My mom is sooo fond of homemade cleaners. She does almost everything by herself. I am going to show her your blog. She will love it. Thank you so much for sharing! Best regards! From the pictures at the top of this post, it looks like you sell this laundry soap. If you do, what is the weight of your packaged soap, and how much do you charge for it? (If you don’t mind me asking!) Thanks! Could you make 100% coconut oil _liquid_ soap, and then dissolve the washing soda into the soap as you dilute the neutralized soap paste? I would think at that point, the saponification would be complete, or am I missing something? Thanks for mentioning Bramble Berry in your post! I love your laundry bar soap and the DIY laundry detergent recipe. I love a good homemade laundry detergent …. There are so many great fragrance options! Hi Amanda!! Thank you for sharing your laundry soap recipe. I can’t wait to try it. I’m new to soaping and have only made HP soap. Quick questions, since this soap doesn’t have to cure, does it matter if it’s made using the HP method? Also, what type of vinegar do you use in the rinse cycle? You can make it the HP method! You might want to increase the water a bit (3 times the lye), but you’d have to try it. Not sure. Just plain white vinegar in the rinse cycle. It may be a silly question, but do you actually need to let the soap harden if you are only going to shred it up again? I make the liquid version of this soap, and was wondering if you could just add the borax, water and washing soda to the coconut soap and not even mold it??? Yes, you would need to let it saponify otherwise the washing soda stuff would mess with the lye. Thank you for this! I also wonder if this can be used in a HE machine. I imagine it would be no problem if the soap is a powder, but would love to know if you’ve tried it. Thank you so much! Hello! Yes it works well in an HE machine. Put it with the clothes (don’t use the dispenser). I make the butter version of this and LOVE it. Will never buy commercial laundry soap again! Now… If I can just figure out something for the dish washer that does not leave a build up. ? Yes, that’s a bit harder. Citric acid helps with that for sure. Can this laundry soap be used in a HE front load washing machine? Do you also have a recipe to make a liquid laundry soap? Thanks. You can get washing soda from most stores. It is with the laundry detergent in a big yellow box. I agree with the 100% coconut bar. I make the Pinterest moms laundry sauce recipe and use 1/2 of felsnaptha and 1/2 a bar of my coconut soap shredded. Boy that detergent is so awesome if you have hard water! I just can’t believe how it cleans! Good bye to Tide! That’s awesome! I love that we can make these products ourselves!